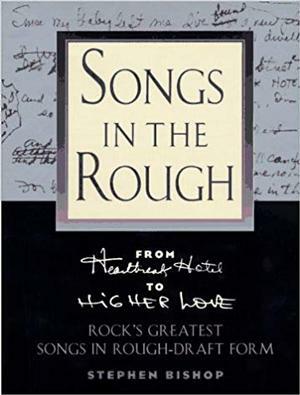 Newly discovered lyrics by Buddy Holly ("'Yes' means we'll go on together/ 'No' means that we'll have to part") highlight Stephen Bishop's Songs in the Rough, which presents 80 top rock and folk songs in their original draft form, as well as interviews with the composers or their surviving relations. Bishop, himself a songwriter who contributes two entries, has tracked down scribbles - reproduced here - that will send shivers down song-lovers' spines: among them, drafts of "Blowin' in the Wind," "Sgt. Pepper's Lonely Hearts Club Band" and "Heartbreak Hotel." There is a short interview with Joni about her collaboration with Crosby on the song "Yvette in English."